Many employees try to put themselves in a customer’s shoes in order to provide the best service possible. Edwin C., a Management Trainee in New York – took this philosophy to a new level. In fact, the customer was so impressed that she wrote a letter of recognition commending Edwin’s superb service. We sat down with Edwin to learn how he went above and beyond. It was the first hot day in New Jersey this summer. The customer was recently in an accident and needed a rental car to get back to work. It was clearly a stressful situation for her but she was very positive and extremely easy to work with. I assisted the customer with getting gas. Unfortunately, there was bumper-to-bumper traffic on the way back to our branch. I knew the customer needed to get on her way so I offered to get out and walk back. I think she was shocked at my offer knowing how hot it was and that I was wearing a suit and dress shoes. But I could immediately sense her gratitude so I was more than happy to walk. What is your reaction to the customer’s letter of recognition? I was taken aback. Helping customers and providing exceptional customer service on a daily basis is just part of my job. When I offered to walk back, I simply wanted to take the stress off her shoulders so she could go on with her day. She was a wonderful customer, and I was glad to be able to go that extra mile (literally) and help her out. There’s no real secret. Every customer is going to be different. You have to figure out what makes them tick by paying attention to details and then come up with a plan to meet their unique needs. At the end of the day, it’s all about staying motivated and maintaining drive to make a difference. You won’t know what to do until you’re actually interacting with a customer, but if you listen to them and stay in the moment, you’ll react accordingly. 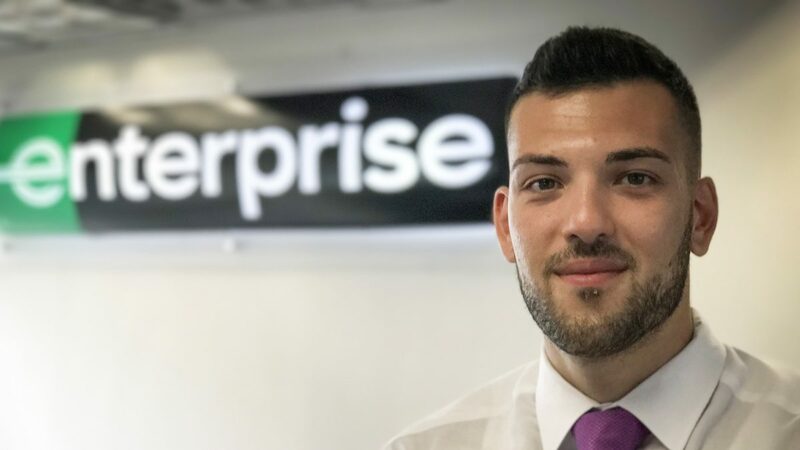 At the time I served this customer I had only been with Enterprise for about six months. It has been a great experience so far. I’ve grown a lot personally and professionally and look forward to my future with the company.